The federal government last week gave the green light for a massive project to expand the Abbot Point coal terminal in north Queensland. Greenpeace ship The Esperanza has arrived in Townsville after sailing up the Queensland coast to highlight the threats of industrialisation and climate change to the reef. The activists say they will seek an urgent meeting with the marine park authority (GBRMPA), calling on it to refuse to issue permits to allow the dumping of dredge spoil within the reef. "The authority's being asked to make this significant call on treating the reef's waters as a dump without knowing the exact location of the final sites," Greenpeace campaigner Louise Matthiesson says. "No one wants to see Abbot Point become another Gladstone. GBRMPA should make a wise decision for the future of the reef and reject the dumping permits." Ms Matthiesson said the Abbot Point expansion presented a double threat to the reef. 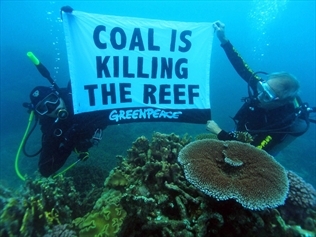 Coal was the major driver of climate change, which was the greatest threat to the reef's long-term survival, she said. Last week, the Queensland government accused green groups of spreading mistruths and wanting to shut down the coal industry. It said the groups were ignoring the facts that the majority of dredging material is clean sand that can be easily settled, and the dumping will occur well away from any coral reefs. A GBRMPA spokeswoman last week said the matter was being considered by a delegate nominated by its chairman Russell Reichelt. Greenpeace says the authority must make a decision on whether to allow the dumping permits by Christmas eve, or seek an extension of time.